The thought of getting into the field in January here in Michigan is nearly impossible, with the exception of drilling through the ice to try and catch some mudpuppies in traps. Normally the state is in the middle of the coldest part of the year with temperatures averaging the low 20s and lots of snow on the ground. It isn't until late March or early April that winter loosens it's grip and life begins to return to the woods. Last winter was unusually mild and gave us a very balmy season with little snow, this ended up being a precursor to the hottest summer on record in Michigan and the worst drought the state and midwest have seen in more than twenty years. The past few days here in Michigan have been nothing short of unusual. Thursday brought temperatures in the high 40s which didn't drop below freezing overnight, followed by a mid 50 degree day on Friday with heavy rain. When I looked at the weather forecast for Saturday and showed partly cloudy skies with temperatures approaching 60 degrees, I called my friend Chris and decided we'd take a shot at some January herps. We arrived to a thawing lowland forest with lots of snow remaining. After a few minutes of flipping fallen logs around a mostly frozen vernal pool, we hit paydirt on our first herp of 2013. This species is probably our most common salamander, a denizen of most woodlands where they spend much of their time in the leaf litter or under logs. 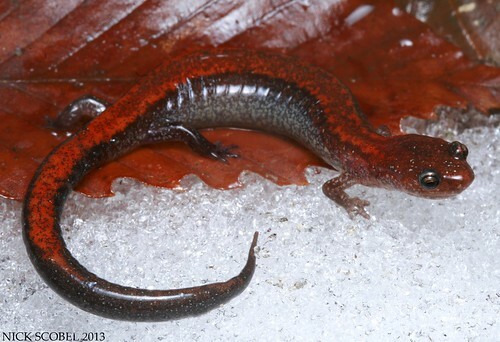 Redbacks don't typically emerge until late March or early April like our other salamander species. This was a large adult; roughly 4" TL, that had a very nice coloration and was cooperative enough to sit still for a few shots. Not long after, the clouds moved out and the sun was shining and we were hoping some snakes would make an appearance. This large garter snake was one of six seen on this warm January afternoon. I thought most would be seen basking close to their hibernation sites, but almost all of the snakes we saw were on the move through the forest floor. 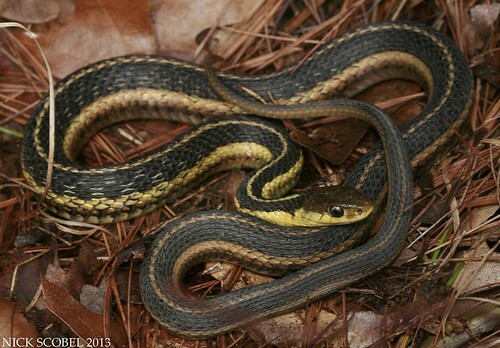 Garter snakes are incredibly efficient at regulating their body temperature. Even when ambient temperatures are in the high 30s, garter snakes can raise their body temp to the high 60s. This makes them quite cold tolerant and explains why they are usually the first snakes seen out in the spring and the last snakes seen out in the fall. 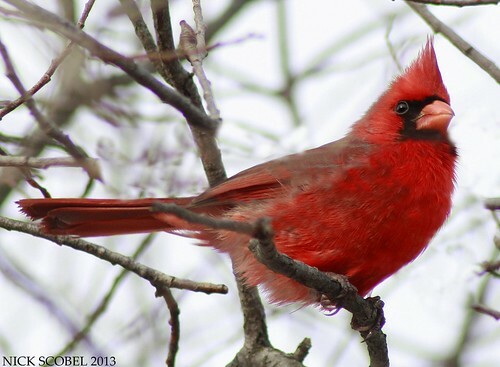 The warm day also had the birds active, I was able to snake a couple decent shots of this gorgeous male cardinal. A female was in the same tree, but I wasn't able to get her into the same shot with the male. We ended up seeing a few more garter snakes and one or two more redback salamanders before calling it a day. Though it was nice to get out in the field in January, the overall concern of how climate change could be affecting wildlife populations is more important. Michigan should have a foot of snow and cold temperatures in the second week of January, not sunny and 60 degrees. I'm hoping that we'll get some heavy snow in the next few months to help combat the lingering effects of last year's drought, especially the vernal pools. That's all for now, until next time try and keep warm! Or cool, depending on how this crazy winter goes the rest of the way.